…THOUSANDS of customers are enjoying the Incite Elite goggle package every time they swim. When ordering our Incite Elite Bundle you do not just get a pair of goggles! Incite Elite’s goggle package has been made for the SERIOUS swimmer. While other companies produce inferior goggles, and do very little, we guarantee the comfort and performance of Incite Elites goggles will not be beaten. We guarantee ultimate comfort, and we guarantee that you’ll feel overwhelmed with how good our goggles really are. Don’t believe us? Test-drive our 100% money back guarantee. The PROVEN science behind our product makes it truly unmatched. We use a single jointed 20mm rubber sealed mould, which provides an unmatched comfort as well as the perfect leak proof goggles. That’s why we can back it with our 100% Money-Back Guarantee. Click the Add to Basket button above to become an ELITE athlete and experience this for yourself ABSOLUTELY RISK FREE! 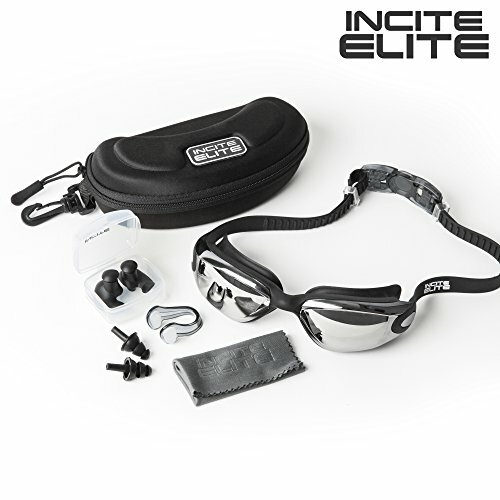 ULTIMATE SWIM GOGGLE SET: Incite Elite have studied many top athletes to create the best swimming set in the WORLD! 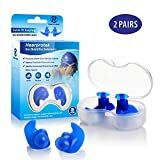 The quality of our product is so high that it would be a crime not to protect them with our FREE PROTECTIVE CASE as well as a NOSE CLIP, and TWO PAIRS OF EAR PLUGS. Think we are done? NO WAY enjoy a free microfibre wipe on the house too! 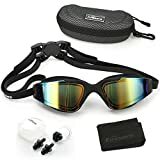 WATER TIGHT AND FOG FREE: Sick of buying a new pair of goggles every six months? Incite Elite have spent countless hours testing for COMFORT, PRACTICALITY & DURABILITY to create the perfect set of swim goggles. With our single joint 20mm rubber sealed mould we were able to push these past the limits of any swimmer would ever go. NO FOG. NO LEAKS. ULTIMATE CLARITY. EASY QUICK RELEASE GOGGLE DESIGN: Our durable and extremely comfortable goggle strap is easily adjustable to fit any size! Our quick release clip-on and clip-off system saves swimmers time and you’ll never have to drag wet straps over your hair again! GUARANTEED ANTI-SHATTER, ANTI-FOG, and MIRROR COATED LENSES: Our durable lenses help to eliminate goggle fogging! Our swim goggles also provide EXCEPTIONAL CLARITY and underwater vision – anti-Shatter technology protects against drops and scratches.